Kansas City, Missouri, 1984. Remember that boring movie Ralph Macchio did after the The Karate Kid where he plays a troubled kid and Nick Nolte is the long suffering, pure-hearted high school teacher fighting the nasty school board and trying to reform all the troubled kids?Congratulations if you do. It was called Teachers. I can’t find a movie called Soldiers, but A Soldier’s Story came out in ’84. Places may refer to Places in the Heart, also from ’84, or possibly Trading Places, but that came out in ’83. 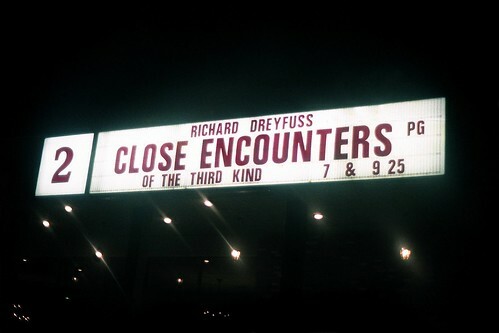 I guess these folks had a limited number of marquee letters to work with? Times Square, New York City, circa 1980. No shortage of letters here! 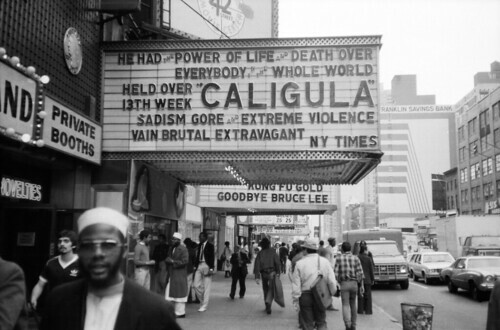 The Goodbye Bruce Lee (1975) on the background marquee refers to an exploitation flick about a martial artist called in to finish an unfinished Bruce Lee flick. New York City, 1977. Another beautiful shot from David Lee Guss. 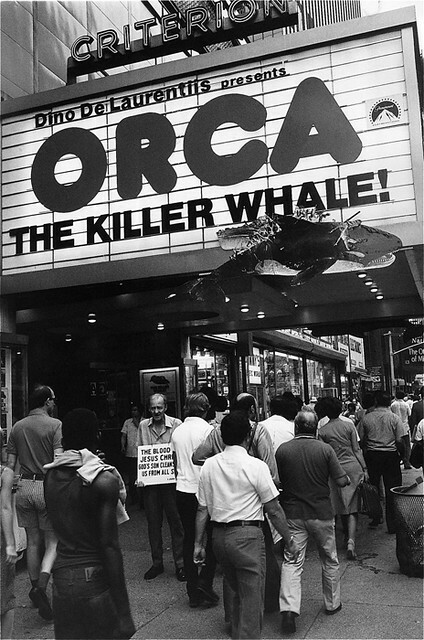 Note the connection between the old man holding the sign invoking the crucifixion—“The blood of Jesus Christ God’s Son cleanses us from all sin”—and the depiction of Orca suffering a crucifixion of his own. Orca was a total bizarre movie for me. I saw it in a Drive-In theater when it came out in ’77, and was traumatized by the slo-mo scene of the baby whale dropping from its dead mother’s belly (I can still vividly remember that scene to this day). Somehow that scene scared the living crap out of me. Interesting. I saw it once, but I don’t remember much. Maybe I just saw part of it, because the scene you describe would have bothered me.